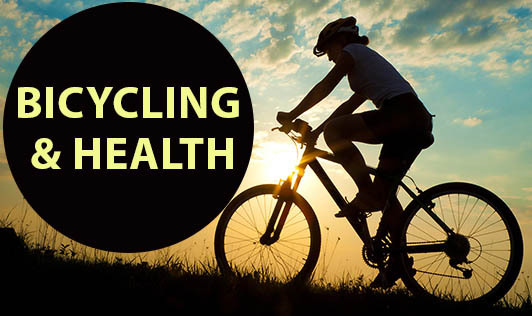 Getting on your bike regularly not only protects you against a wide range of ill health but also makes you feel better. Cycling exercises the heart better than walking. Cycling is good for your heart and health. Cycling reduces the risk of serious conditions such as heart disease, high blood pressure, obesity and the most common form of diabetes. Cycling helps in weight management. Cycling can be part of a program to lose weight because it burns the energy supplied by a chocolate bar or a couple of alcoholic drinks in an hour (about 300 calories). Cycling can improve your mood. Cycling can have positive effects on how we feel too. Moderate exercise has been found to reduce levels of depression and stress, improve mood and raise self-esteem, and has also been found to relieve symptoms of premenstrual syndrome. Cycling can help to maintain strength and coordination. This is more important than it seems because leg strength improves other mobility by allowing people to get out of chairs more easily, and helps older people especially avoid falls and the broken bones and other injuries associated with them. Physically active older people have much reduced rates of hip fracture.